Dr. Ashraf Ghani, Chairman of the Institute for State Effectiveness, was named as among the most influential global thinkers for his work on fragile states (named among 100 top global thinkers by the Foreign Policy). As Adviser to the UN Secretary General he advised on the Bonn Agreement for Afghanistan, and then as Afghanistan’s Finance Minister between 2002-2004 he is credited with a series of successful reforms in Afghanistan, including reform of the treasury, customs, budget and the currency. He prepared Afghanistan’s first National Development Framework and Securing Afghanistan’s Future, a $28bn reconstruction program for the country. In 2010, he developed and facilitated the successful Kabul Conference and Process to build internal consensus and external alignment on priorities in Afghanistan. 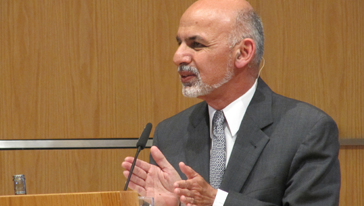 Ghani was named best finance minister in Asia by the Emerging Markets in 2003.